The 3- to 7-inch-long horned lizards are the American (iguanid) equivalent of the Australian Moloch (an agamid) and reflect the convergent evolution of similar body shapes and life histories in different lines living on different continents. Fifteen species range over most of the southwestern United States and far south into Mexico. 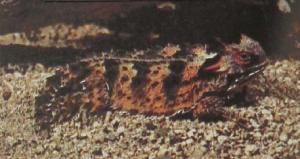 These are diurnal species that feed on insects, some of them having specialized on ants which are avoided by most other kinds of lizards. 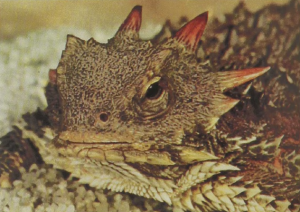 Several species of horned lizards can survive for long periods, even in deserts, without free water by making use of the nightly dew. Some species can rupture a blood vessel in their eye and spray the resulting fluid for some inches. Apparently this greatly disconcerts such predators as coyotes, which tend to avoid them.